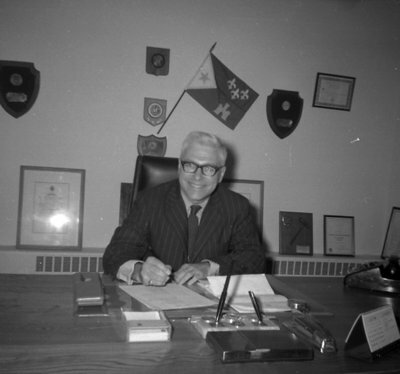 A black and white photograph of Marcel Robidas (November 4, 1923- May 17, 2009), the Mayor of Longueuil Quebec, in his office in June of 1970. Whitby Twinning Visit to Longueuil, Quebec, June 1970, Brian Winter. Whitby Archives A2013_004_328.